After the intense media scrutiny that followed the revelations of the nature and extent of the IRS plan to target Center-Right groups and the resulting Congressional investigations, the IRS and the Obama Administration began to weave a cover story to “explain” what had happened. The first step was to release a report in June 2013 entitled Charting a Path Forward. The report is a fascinating document because it gives lip service to the idea that the IRS had used “inappropriate” criteria for targeting Center-Right groups. However, at the same time, the IRS created, in effect, a new, higher threshold for qualifying as a Section 501(c)(4) group. Although the new threshold was explained as a “safe harbor” that would ensure a group received an appropriate and proper level of review by the IRS, the “safe harbor” actually describes a far more burdensome path to a tax exemption. Among other things, the report set a new 60% threshold of non-political activities as a baseline requirement for qualifying as “social welfare” organization, rather than the historic “primarily” (or 50%) threshold. In addition, the IRS ignored the fact that inherent in the concept of a “social welfare” organization is the function of commenting upon and lobbying for political change. This proposed “safe harbor” makes the quest for tax exempt status by any “social welfare” group a questionable goal. Significantly, the safe harbor proposal only applies to applications for Section 501(c)(4) status and no other type of tax exemption determination. Any thought that this report was a mistake, or was anything other a continuation of the earlier attacks on Center-Right groups, was laid to rest by the IRS over Thanksgiving weekend last year. Under cover of the Holiday weekend, the IRS released proposed new rules governing the application process and scope of activities that it was seeking to impose upon Section 501(c)(4) organizations. (Guidance for Tax-Exempt Social Welfare Organizations of Candidate-Related Political Activities, 78 Fed. Reg. 71,535 – November 29, 2013) (hereinafter “Guidance”). The Guidance contains proposed new regulations governing Section 501(c)(4) organizations that would severely restrict their ability to participate in the discussion of any public issues. For example, the Guidance would prohibit such an organization from discussing any public issue that might, directly or indirectly, influence any candidate election or any type of ballot issue on a public issue. These restrictions would apply for 60 days prior to a general election and 30 days prior to primary election. In effect, the IRS is seeking, by regulatory fiat, to impose the criticized McCain-Finegold campaign finance “electioneering” restrictions into the Internal Revenue Code. In addition, unlike the McCain-Finegold provisions, which are at least geographically restricted and only apply to “broadcast” advertising, these regulations would apply to all communications, no matter how disseminated. Accordingly, during the time periods most voters are listening to the debate on public issues – Section 501(c)(4) organizations would be completely barred from speaking on their issues. In addition, Section 501(c)(4) organizations would be prohibited from conducting, even non-partisan, voter registration or GOTV activities. They would also be prohibited from issuing any type of voter guide or information regarding their views on various candidates or ballot issues. Not surprisingly, these restrictions would only apply to Section 501(c)(4) organizations, leaving groups such as labor unions (that are tax exempt under Section 501(c)(5)) free to participate in all of the foregoing activities. This fact alone, confirms the suspicion that the IRS is simply carrying out a partisan mission for the Obama Administration that has nothing to do with sound policy objectives. Tens of thousands of comments have been made on these proposed regulations by interested groups and individuals. Almost universally, they have been negative. Even the ACLU filed a harsh response to these proposed regulations on February 4th of this year, identifying these proposals as tantamount to complete censorship and the implicit destruction of the entire concept of a “social welfare” group. In light of the volume of criticism, the IRS may delay in officially adopting these new regulations until after the November 2014 elections and have them in place for the 2016 election cycle. Even if there is a delay in adopting the regulations, we should expect that the IRS will enforce these fundamental concepts even without final adoption of the regulations. The Service has made it clear that they do not believe that the regulations are breaking new ground – but are simply describing existing law in this area. 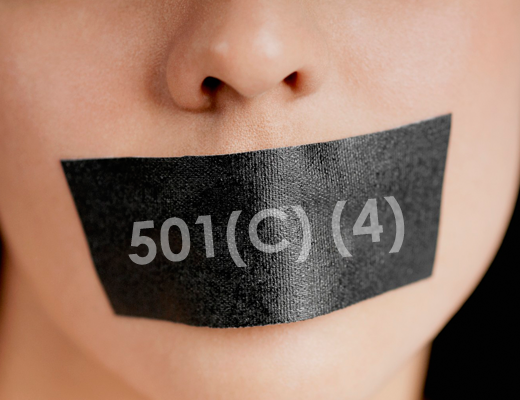 There is little doubt that the Obama Administration intends to continue its attacks on Section 501(c)(4) organizations. The IRS will be the “point of the sword” in the effort to limit the ability of these groups to participate in the debate of public policy issues. This initiative strikes at the heart of the mission and purpose of “social welfare” organizations. Simultaneously, we should expect that the Democrats will begin to use other types of legal structures to advance their viewpoint on the issues, such as labor unions and “for profit” organizations. In addition, as in the case of the 2013 attacks on “tea party” groups, we can expect continued “selective enforcement” of the new IRS standards for “politically correct” behavior by Section 501(c)(4) organizations. These attacks will take a variety of forms – but all will be calculated to disrupt the messaging from organizations articulating any viewpoint that is contrary to that of the Administration. On the Center-Right we must be prepared for these attacks and plan to carry on delivering their messages in the face of the hostility of the IRS. In addition, alternate structures need to be considered such as the adoption of the non-profit, taxable corporation. No previous Administration has adopted such an overt and calculated strategy to use the IRS to silence its opponents. The Center-Right must be prepared to resist being censored by the IRS, because this is a battle that we must win to preserve our cherished freedoms.